Vedantu.com - No.1 online tutoring company in India provides you the Free PDF download of NCERT Solutions for Class 7 Science Chapter 8 - Winds, storms and cyclones solved by Expert Teachers as per NCERT (CBSE) Book guidelines. 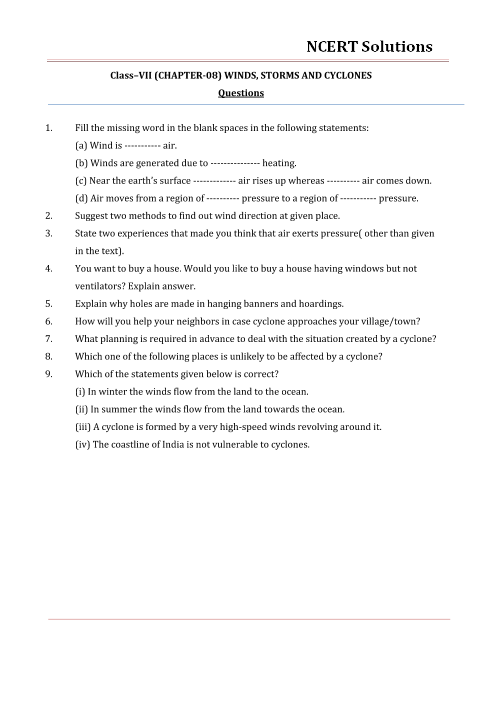 All Chapter 8 - Winds, storms and cyclones Exercise Questions with Solutions to help you to revise complete Syllabus and Score More marks. Register for our free webinar class with best Science tutor in India. Natural calamities affect one and all. Rich or the poor, both bear the fury of the natural calamities. Tsunami floods, cyclones and storms are something that prove a grave threat to life and property alike. NCERT Grade 7 Science Chapter 8, Winds, Storms and Cyclones deals with the science behind these natural phenomena. Why? How? When are they formed? How to detect them? How to protect ourselves from them? These questions are answered through this chapter. Activities that demonstrate air pressure, nature of the air under different conditions and its effects are explained in this chapter with the help of images and figures.Winds, Storms and Cyclones are the derivatives of the wind. NCERT Grade 7 Science Chapter 8, Winds, Storms and Cyclones discusses difference between them. Air exerts Pressure, High Speed Winds are Accompanied by Reduced Air Pressure, Air Expands on Heating, Wind Currents are Generated due to Uneven Heating on the Earth, Thunderstorms and Cyclones, Destruction caused by Cyclones and Effective Safety Measures are some of the main topics covered in this chapter. Introduction to new concepts, new technical terms, Project work and demonstrations, make this chapter very creative and colourful.Students get accustomed to new terms and phenomena that shall help them in the future to deal with complex concepts associated to Winds, Storms and Cyclones. Get 100 percent accurate NCERT Solutions for Class 7 Science Chapter 8 (Winds, storms and cyclones) explained by expert Science teachers. We provide solutions for the questions given in Class 7 Science textbook as per CBSE Board guidelines from the latest NCERT book for Class 7 Science. The topics and sub-topics in Chapter 8 Winds, storms and cyclones are given below. Ex 8.8 - ADVANCED TECHNOLOGY HAS HELPED. Chapter 8 - 9 Questions with Solutions. Other than given exercises, you should also practice all the solved examples given in the book to clear your concepts on Winds, storms and cyclones. Download the free PDF of Chapter 8 Winds, storms and cyclones and take the print out to keep it handy for your exam preparation.